So, as you may have heard, Warner Brothers have snapped up the rights to Dungeons & Dragons to do another movie under the title of the gaming franchise. As I’ve already mentioned in my previous article, I am a long-time fan of the D&D franchise, having played the tabletop game since college and its PC incarnation, Baldur’s Gate, before that. Dungeons & Dragons has had many facelifts over the years and is now in its fifth edition. Not every one of the franchise’s outings has been successful however, and one such botched job was the poorly received original movie back in 2000. Not even the star power of Jeremy Irons and the marmite comedy of Marlon Wayans could salvage this movie from being terrible (although Richard O’Brien as the head of the Thieves’ Guild was a stroke of casting genius!). Pretty sure this was Jeremy Irons’s face after reading the first D&D script. Now, this new film venture has already faced a number of legal battles based on the previous film incarnations (yes, plural. It was a trilogy) due to licensing and what-have-you. This has now apparently been navigated around by, rumour has it, having this new film set within the Forgotten Realms world. You may, on your travels, have heard the name R.A. Salvatore. Or perhaps, if that doesn’t ring any bells, you might know of Drizzt Do’Urden. Salvatore is an author, heralded as the Godfather of the Forgotten Realms world and the creator of many fanfic fuel characters such as Drizzt and long-time rival, Artemis Entreri (do not, I repeat do not Google the slashfics, unless you’re into that sort of thing). Will we see these characters in the new film? Who knows. It’s too early to say. 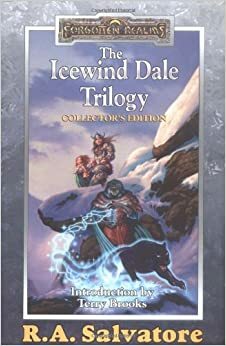 But I will suggest you go out and buy the Icewind Dale trilogy of books to find out more about the setting and its characters. Seriously, go read it! I’ll wait. The last foray into the Dungeons & Dragons world of cinema did not end well, with one bad big screen effort and two straight to DVD sequels (which were arguably better films, actually). However, with WB at the head of this one, we can at least hope that there will be enough of a big studio push to make this. Saying that, having looked at the production team signed up already, I will remain hesitantly sceptical. On the one hand, we have Roy Lee (Producer of The LEGO Movie) and Stephen Davis (My Little Pony: FiM, which seems pretty popular), as well as Hasbro executive Brian Goldner to ensure it stays true to their intellectual property (Hasbro owning Wizards of the Coast). But, on the other hand, Courtney Solomon, from the original movie’s production staff, is returning and the script has reportedly been written by a chap called David Leslie Johnson, famous for writing Wrath of the Titans, Orphan and 2011’s Red Riding Hood (you know, those great, ground breaking blockbusters). D&D will always have my heart from a gaming perspective and every ounce of me wants this to be a good venture for WB, especially after all of their hard work with the DC Comics TV shows. I want this to be the breath taking sword and sorcery fantasy epic it deserves to be, but I can’t help but wonder if it will be a brave new world as we step into the Forgotten Realms? Or will this all just be a sad case of history repeating? Only time will tell. In the meantime, St. Cuthbert guide your way and Obad Hai see your crops grow bountiful. May your loot be great and your dice forever roll well! I’ve been Craig. But at the weekends I’m a level 12 badass. As yet, D&D has no confirmed director or release date. Craig has been raised on geekery from a young age when his Mum introduced him to Star Trek the Next Generation on TV as a kid. Since then, he has gained a wide love of all things "Geek", be it books/comics, cinema or gaming in all formats. He has a particular keen interest in all manner of RPG, be it on a tabletop or in a field larping.